Why did Albania enjoy some of the most successful anti-corruption programs and institutions along with what appeared to be growing levels of corruption during the period 1998-2005? 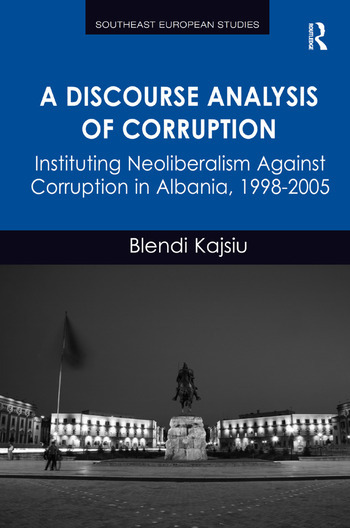 Looking at corruption through a post-structuralist discourse analysis perspective this book argues that the dominant corruption discourse in Albania served primarily to institute the neoliberal order rather than eliminate corruption. It did so in four interrelated ways. First, blaming every Albanian failure on corruption avoided a critical engagement with the existing neoliberal developmental model. Second, the dominant articulation of corruption as abuse of public office for private gain consigned it to the public sector, transforming neoliberal policies of privatisation and expanding markets into anticorruption measures. Third, international anticorruption campaigns reproduced an asymmetric relationship of dependency between Albania and the international institutions that monitored it by articulating corruption as internal to the Albanian condition. Finally, against corruption international and local actors could articulate a neoliberal order that was free of internal contradictions and fully compatible with democratization. As a rare example of post-structuralist discourse analysis of corruption this book can be useful for future research on discourses of corruption in other countries of the region and beyond. Blendi Kajsiu is lecturer at the University of New York in Tirana, Albania. He holds a Ph.D. in Ideology and Discourse Analysis from the University of Essex, United Kingdom. His research has appeared in journals such as East European Politics and Societies (EEPS), Nationalities Papers, and SÃ¼dosteuropa.